An exotic version of our traditional fruit-and-nut candies! We slow-cook the essences of tropical fruits, then mix in scoopfuls of buttery macadamia nuts for a taste that's truly "no ka' oi" (the best). Our Tropical Fruit Assortment includes six flavors straight from the islands...Banana, Papaya, Guava, Passion-Orange, Pineapple, and Coconut. 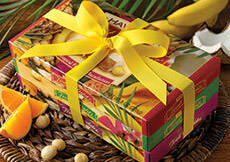 Or get the same six flavors drenched in a rich chocolate blend with our Hawaiian Fruit Chocolates! Kosher. TROPICAL FRUIT DELIGHTS: sugar, corn syrup, nutmeats (macadamias, cashews), modified corn starch, pectin (pectin, disodium diphosphate, sodium polyphosphate, dextrose, dicalcium phosphate), dried fruit (pineapple, papaya, guava, passion fruit), dried coconut, natural flavors, sodium citrate, citric acid, malic acid, soy lecithin. ALLERGEN INFORMATION: May contain traces of peanuts or tree nuts not listed in the ingredients. Our macadamia nut candies include a small amount of cashews. 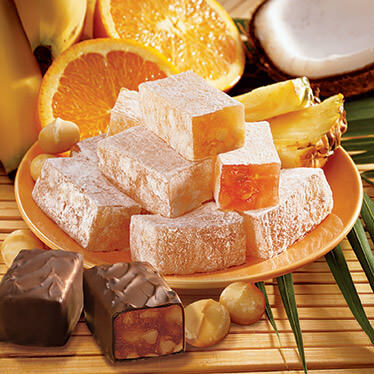 PINEAPPLE & MACADAMIA DELIGHTS: sugar, corn syrup, nutmeats (macadamias, cashews), modified corn starch, pectin (pectin, disodium diphosphate, sodium polyphosphate, dextrose, dicalcium phosphate), dried pineapple, natural flavors, sodium citrate, citric acid, malic acid. TROPICAL FRUIT CHOCOLATES: sugar, corn syrup, nutmeats (macadamias, cashews), chocolate liquor, modified corn starch, fruit (guava, pineapple, papaya, passion fruit), coconut (with sodium metabisulfite to retain color), cocoa butter, milk, pectin (pectin, disodium diphosphate, sodium polyphosphate, dextrose, dicalcium phosphate), butter oil, natural flavors, soy lecithin, sodium citrate, citric acid, malic acid, yellow 5, yellow 6, red 40. When I was a little girl, my favorite candy could only be found at my grandparent's homes in Spokane. 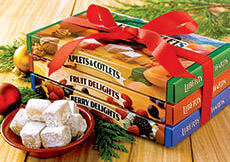 Aplets and Cotlets were the most delicious candies in the world. But my family moved all over, and by the time I was an adult, I almost never came across these magnificent morsels. In 2014, I moved to Mt. Shasta, CA, and lo and behold, I not only found my beloved candies, but the tropical flavors as well. I immediately purchased a box of the previously unforeseen sweets, and can now attest to the amazing flavors that LO has created by using their genius candy making skills to create tropical flavors of the most delicious candies on earth. YAY!!!! Thank you LO, you have renewed my faith in the flavors of my childhood, and added a few new treats to the table. Thank you soooooo much. OMGosh! A co-worker brought in some Pineapple & Macadamia Delights and we now call her the Pineapple crack dealer! Those things are amazing and you can't eat just one. That box disappeared so fast it was unbelievable! YUM! 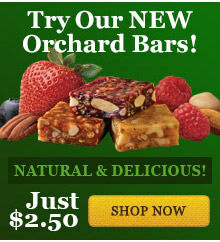 http://jwinclos.blogspot.com/2013/08/liberty-orchards-fruit-and-hawaiian.html Another wonderful snack to consume. Addicted. Tasty goodness that will leave your taste buds asking for more. Delicious.